You are invited to stay after the official opening by John Kinsella to hear Filomena speak of her work and join in casual conversation, nibbles and wine. While in York, Filomena will undertake a short residency and is offering a two-day workshop, Re-imagining Flowers. Filomena Coppola’s work is a response to being born in the regional Victorian town of Mildura to Italian immigrants. Delicate pastels capture Filomena’s cultural duality – of being a hybrid of Italian/Australian cultures. 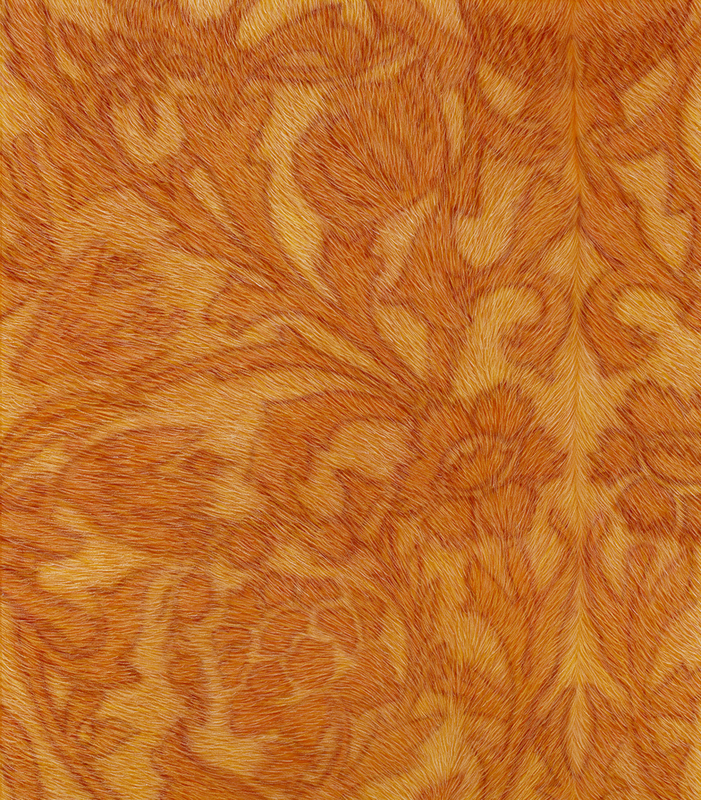 This is represented in her work through presence/absence, plant/animal, and internal/external. 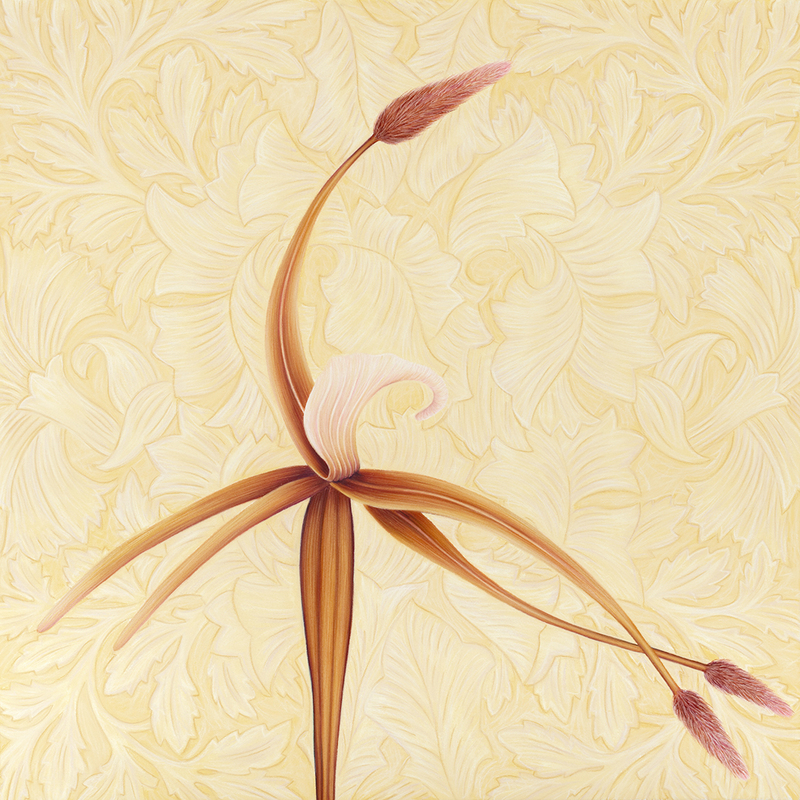 Her work utilizes segments of native Australian orchids; intentionally taken out of context, enlarged and drawn so that the texture of the petals resembles animal fur. They are depicted in the foreground of William Morris wallpaper designs, a reference to the migration of her parents to an English colony. Together these elements subvert their original forms and infer cultural integration – morphing and mutating. Filomena’s work responds to the complexities of cultural integration, the role of the feminine as well as environmental issues connected with time as measured by the equinoxes, solstices and cross quarters. In Fish out of Water – Murray Cod a sensitive intervention project that journeys the length of the Murray River, Filomena traverses over 9000 years of history contained within the petrified red gum, and presents the Murray Cod as the fish out of water. Out-numbered by carp, but carrying the name of the great Murray River – this work is symbolic of the cultural, environmental and historical changes that continually occur on this continent. Filomena Coppola has exhibited widely over the past ten years and has been included in several drawing exhibitions including JADA Drawing Award, The Robert Jacks Drawing Award, the City of Banyule Drawing Award and The Hutchins Drawing Prize, where she was awarded a Judges Selection in 2001, and she was awarded The City of Hobart Art Prize in 1994. Filomena has been the recipient of several awards and residencies including Arts Victoria Development Grant 2013 (for Alpha Sound), Regional Arts Victoria Project Funding in 2012 (for Mother Tongue), the Vermont Studio Centre Residency and Part Fellowship, Vermont, USA in 2004, Ian Potter Foundation Individual Grant in 2001, Arts Tasmania Development Grant in 1999 and the Rosamond McCulloch Scholarship to the Cite Internationale des Arts, Paris in 1997. Her work is represented in collections including Artbank, Parliament House Collection Canberra, Print Council of Australia, University of Tasmania Launceston and Hobart, Mornington Peninsula Gallery, The Hutchins School, Banyule City Council and the Devonport Art Gallery.